a) The GEMS FAB Credit Card that offers up to 4.25% discount on school fees. b) The GEMS Ambassador Programme – offering cashback benefits to parents who refer children into participating schools, upon successful enrolment. 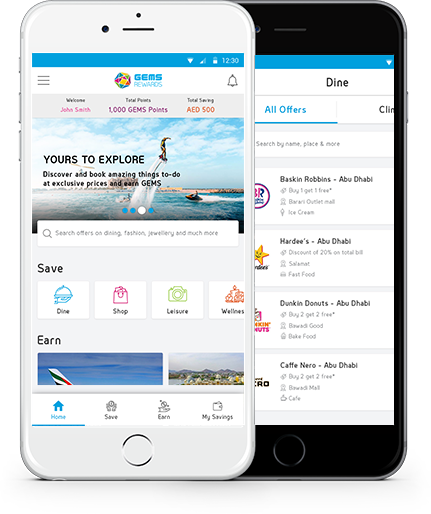 c) Everyday Savings – through a network of partners across dining, retail, travel, and entertainment etc. GEMS has negotiated offers and discounts that significantly contribute to everyday savings. We will continue to build this network and widen our offering, as we strive to deliver better offers every day. The GEMS Rewards App is reserved exclusively for the GEMS Community, including GEMS families and staff. Upon enrolment, you will receive an email from GEMS, which includes your Membership details, as well as your GEMS Rewards App login information. Can be used 7 days a week, at any time during the issuing merchant’s trading hours – minimal exclusion days apply. Buy One Get One Free Offers can be redeemed by a minimum of 2 people (excluding some Beauty & Fitness and Retail & Services Offers). Up to 4 Offers can be redeemed at one time for a group of 8 people or more. Discount Offers and Spend and Save Offers, should be presented prior to payment or requesting the bill. Are not valid in conjunction with any other discount offers, promotions, special menu items or loyalty/rewards programmes. Offers are valid as indicated on the Offer. We reserve the right to remove and/or amend an Offer at any time, and cannot be held responsible or liable in any way if an Offer is removed or amended from GEMS REWARDS. Offers are valid 7 days a week any time during the issuing merchant’s trading hours, unless specified on the Offer. Minimal exclusion days apply. Offers listed are available per merchant and not per outlet. Thus, when you redeem an offer it will show as redeemed at all locations for that merchant. Once you have redeemed all offers for a merchant, all locations will be locked. A Main Course/Main Menu Item is defined as the main element of a customer’s lunch or dinner – i.e. not a starter or a dessert. GEMS REWARDS is not responsible for the specific layout/design of a merchant’s menu. If in doubt, clarify with the server before ordering. One Offer can be used to redeem one qualified item only, unless otherwise specified. One Offer can be used by 2 people, for up to a maximum of 4 Offers per table, for a group of 8 people or more (see Table 1). This Rule applies regardless of the product the Offer is from. E.g. A group of 4 people can redeem 2 Main Course Offers at a restaurant, alternatively they can redeem 1 Licensed Drink Offer and 1 Main Course Offer - redeeming a maximum 2 Offers in total. The least expensive item (as listed on the Offer), will be deducted. The two items must be from the same category as marked on the Offer. E.g. Buy one “Main Course” and get one “Main Course” free; or buy one “Sushi Set Lunch” and get one “Sushi Set Lunch” free; or buy one “House Beverage” and get one “House Beverage” free. Only one bill will be presented per table, per group. No splitting of bills will be allowed. Offers are not redeemable for breakfast, starters, side dishes, desserts or shared platters, unless otherwise indicated on the Offer. Offers are not valid for delivery or take-away, unless otherwise indicated on the Offer. Licensed Drink Offers are intended for the use of persons of legal age who are non-Muslim, to purchase Licensed Drinks. Licensed Drink Offers are exclusive and not valid in conjunction with any other promotion or special menu items, including “Happy Hours” and “Ladies’ Nights” offered by the merchant. A maximum of 4 Offers can be redeemed per booking/table/group (as outlined in Table 1). This Rule applies regardless of the product the Offer is from. For example, a group of 4 people can redeem 2 Licensed Drink Offers, alternatively they can redeem 1 Licensed Drink Offer and 1 Main Course Offer - redeeming a maximum of 2 Offers in total. A minimum of 2 people must be present to redeem a Buy One Get One Free Offer – unless otherwise specified. A maximum of 4 Offers can be redeemed per booking/visit for a group of 8 people or more (see Table 1). The Discount Offer (% Offers), can be used against the service/item/activity mentioned on the voucher. The discount will apply only on normal rates/prices and cannot be used in conjunction with other promotions or special offers. These offers would need to be presented before the service/item/activity is purchased. Terms & Conditions may vary with a number of activities, so please refer to the individual merchant/outlet for confirmation of minimum/maximum number of people, age restrictions, safety guidelines as well as other conditions. Offer will not be valid on any public holiday. One Offer can be used by 2 people within the same visit, with the second treatment or service being complimentary. One Offer can be used by an individual, whereby you must pay full price for the first treatment/service and your second treatment/service, will be complimentary on your next visit. The merchant provides a voucher for the second treatment/service to be used on the next visit. The complimentary treatment/service must be redeemed within the Offer validity period. Please note: Gift vouchers cannot be issued for your complimentary treatment/service. The complimentary treatment/service is non-transferable. Please present the Offer, at the completion of the treatment/service, prior to requesting the bill. If the Offer is in the Health & Fitness section, please present it prior to the commencement of any class or activity. These terms and condition govern the collection and use of points and set out the terms of the contract between GEMS MENASA Cayman Limited (GEMS, us or we) and each Member. A Member will be automatically registered with the GEMS Points collection programme (GEMS Points) by downloading the App and creating and account (an Account) and can then earn points through various Earning Channels. If you apply to register an Account or use the App you accept these terms and conditions. We may refuse an application to register an Account for any good reason. An account to record the GEMS Points earned or redeemed by each Member will be established by us. The number of GEMS Points currently credited to a User's GEMS Points Account can be viewed on the App by swiping left on the home screen. GEMS Points balances cannot be transferred to any other Member at any point of time. GEMS Points may only be earned at the time a relevant transaction through an Earning Channel is completed and cannot be earned or claimed retrospectively. GEMS Rewards reserves the right, in its absolute discretion, to adjust (including by deduction) the number of GEMS Points accrued or credited to an Account, if GEMS Points have been accrued or credited in error (including as a result of error arising from a misrepresentation, negligence, or technical malfunction) or for any other reason resulting in the GEMS Points being invalidly accrued. We will correct an Account if it is shown to our reasonable satisfaction to be incorrect however, any decision to do so will be subject to the Member producing clear records demonstrating an error. Our decision is final in relation to any correction. If a transaction on which GEMS Points are earned or issued or redeemed is cancelled, reversed or not completed, we will reverse the associated adjustment to the GEMS Points. Our decision is final in relation to any such reversal. GEMS Points can only be redeemed against the school fees that a Member is liable to pay to GEMS or any of its affiliates (GEMS School Fees). All redemptions must take place through the designated Oasis Portal that is provided by GEMS. Each GEMS Point shall be deemed, for the purposes of redemption against GEMS Schools Fees only, to have a value of AED0.09. GEMS Points cannot be exchanged or redeemed for cash. GEMS Points cannot be redeemed until credited to a GEMS Points Account. Depending on the Earning Channel it will take different periods to notify us of points to be credited. We are not responsible for a failure, delay or error by any third party failing to notifying us of GEMS Points to be credited. GEMS Points cannot be redeemed unless the Member has, at the time of the redemption, a minimum of 2,225 GEMS Points (the Minimum Points) credited to his/her Account. We reserve the right to vary the Minimum Points from time to time. A Members may choose to redeem the GEMS Points credited to their Account in full or in part only, however, conversion that would result in a Member holding a fraction of a GEMS Point will be rounded up to the nearest whole GEMS Point. If a Member does not redeem the entire value of his/her GEMS Points, the balance value will remain in their Account and may be used for future redemptions provided that he/she has the Minimum Points credited to his or her Account at the time of redemption. GEMS Points once redeemed cannot be used again. GEMS Points once redeemed cannot be reversed. GEMS Points cannot be transferred to or redeemed by another Member or any person other than the Member to whose Account those GEMS Points are credited. If the value of the invoice for GEMS School Fees is more than the value of the GEMS Points credited to that Member's Account then the balance amount must be paid by the member using a valid payment method (as determined by GEMS) simultaneously with the completion of the redemption. GEMS Points which are not redeemed by a Member will remain credited to his/her Account for a period as governed by the GEMS Rewards Expiry Policy. Expired GEMS Points will be deducted from a Member's Account and cannot be re-credited to the Member's Account. GEMS Rewards reserves the right (in its absolute discretion) to adjust the number of GEMS Points accrued or credited to a Member's Account if the GEMS Points it determines that were credited or accrued invalidly (including but not limited to as a result of error or misrepresentation, negligence, or technical malfunction). GEMS Points will have a minimum expiry of 11 months and 30 days and a maximum expiry of 23 months and 30 days from date of earn. All GEMS Points earned during an Academic Year (meaning a 12 month period commencing on 1st September and ending on 31st August) will expire on the 31st August of the following Academic Year (meaning, for example, that GEMS Points earned on 2 September 2018 will expiry on 31 August 2020). GEMS Points will expire and be lost if the relevant Account is closed or the GEMS Points programme ends (which GEMS may elect to do at any time and at its sole discretion). We may close any Account on which no GEMS Points have been earned or redeemed for a continuous period of at least 12 months. We may also, on notifying the Member, immediately suspend or terminate the rights of any Member, and/or close any relevant Account, if they breach these Terms and Conditions, if we reasonably believe that a Member has dealt with GEMS Points in a manner not permitted by these Terms and Conditions or any Earning Channel Partner, if there is any theft from or misconduct in connection with us or any Earning Channel Partner, if a Member supplies any false or misleading information to us or if they are abusive or offensive to any member of our staff. A Member can close his/her Account at any time by notifying us. If an Account is closed all rights to redeem GEMS Points from that Account are lost. We may terminate or suspend the GEMS Points programme at any time but will give as much notice as we reasonably can before we do so. If this happens all Accounts will be suspended or terminated. If we sell or transfer GEMS Points to another company we may transfer all of our rights and obligations under these Terms and Conditions without any further consent and may disclose or transfer all information we hold about Members to a prospective or actual new owner. Such a disclosure or transfer will not alter the rights of such Members in respect of the use that can be made of such information by such other company. Please note: A limited number of outlets may be closed over summer, Ramadan and other selected religious holidays. We cannot be held responsible if an outlet is temporarily or permanently closed during the Offer validity period. The barter, trade, sale, purchase or transfer for compensation of any GEMS REWARDS product or any of its Offers or contents by any person or entity, including but not limited to, travel services, travel providers, and distributors of the product or any of its Offers, is strictly prohibited, unless expressly authorised by GEMS REWARDS. The product and its Offers and other content are intended for the non-profit use of the individual purchaser of the Offers. Additionally, the use of the product or any of its Offers for advertising purposes is strictly prohibited. Any use of the Offers in violation of these Rules will render the Offers void, and GEMS REWARDS will avail itself of any and all legal remedies available to it. Offers may not be reproduced and are void where prohibited or restricted by law. GEMS REWARDS will not be responsible for the closing down or refusal of any merchant to accept GEMS REWARDS vouchers; however, we will use reasonable efforts to rectify the situation, to the extent possible. GEMS REWARDS will not be responsible in the event that acts of God, fire casualties, illness, injuries or other events beyond its control, prevent you from using any Offer. Copyright in the text, images, photographs, graphics, layout and design of GEMS REWARDS products are protected by local and International copyright laws. Copyright in all GEMS REWARDS products and in the text, index, rules of use, offers, layout and other copyrights works contained in each GEMS REWARDS product, is owned by GEMS REWARDS, or used with permission. No part of any GEMS REWARDS product may be reproduced in any form (including by electronic or mechanical means, photocopying, recording, or information storage and retrieval) without the written permission of the publisher. The GEMS REWARDS wordmark and logo are the trademarks and/or registered trademarks of GEMS REWARDS. Other trademarks, artwork, copy and/or translations of copy appearing in this publication are used with permission of their respective licensed owners.